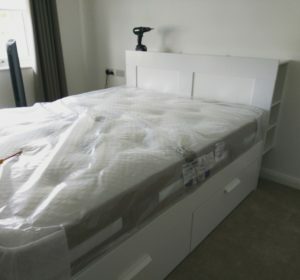 We are an professional independent London based flatpack furniture assembly service. In operation since February 2007. We assemble all types of flatpack furniture and equipment for customers in their homes and offices. We cover all of London and the surrounding counties. We offer low prices and a flexible billing structure, we have evening and weekend appointments available. Also we can often offer you a same day service. Starting at just £30 per hour and prices calculated every 15 minutes so you’ll get great value for money. Alternatively we might be able to help you to take furniture with you as we offer a dismantling & rebuild service. Ikea, Habitat, Argos, Homebase, Tesco, Dwell, Heal’s, Mamas & Papas, John Lewis, Mothercare, Bensons for Beds, Harveys, Asda, B&Q, Thuka and many more. No booking fee, No call out charge, No VAT.